September 23, 2017 – Hannah Shira Naiman – We regret that this concert has been canceled and will be rescheduled as soon as possible. We apologize for the inconvenience. 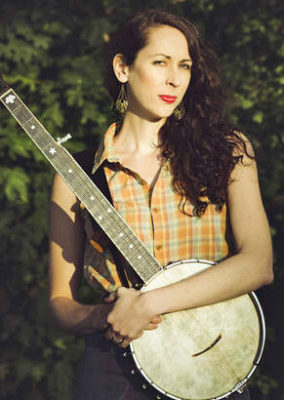 Hannah Shira Naiman‘s Hannah Shira Naiman’s banjo-grounded songs dance the listener into the Appalachian mountains and eras back in time, drawing on her roots in Toronto’s ‘old time’ folk music community to share powerful tales of hope and loss. Naiman grew up around folk music as her celebrated banjo-playing father, Arnie Naiman, and award-winning children’s musician mother, Kathy Reid-Naiman, brought her to numerous folk camps and festivals every year. But it wasn’t until she left home that Hannah began to explore her father’s instrument in a new way. Collaborating with vocalist Emily Adam as part of folk duo The Blackest Crow sparked a more serious interest in making music. Naiman’s acclaimed debut record Tether My Heart sailed past its IndieGoGo funding target and earned rave reviews for its strong musical backbone. Penguin Eggs’ Mike Sadava recognized Naiman’s “high calibre of songs, her clean clawhammer banjo playing, and her singing that is clear as a bell.” In fRoots Magazine, John Atkins wrote that “the songs, all original, could easily be taken as being traditional, such is her mastery of the genre.” Interest in the record led to a tour through the U.S. Northeast and Canadian prairies, invitations to international folk conferences, a top 10 spot in the Folk DJ list, and play across CBC Radio. With her most recent record Know the Mountain, released in October 2017, Naiman charms the listener with an even more bold, layered, and mature set of tunes that cross from sweet waltzes about fishes and birds to dark murder ballads and haunting instrumental reels. Naiman intensely studied fiddle — a new instrument to her — near the mountains of Virginia and West Virginia between records, and shares the result of her latest inspiration in two original fiddle tunes. Banjo virtuoso, Arnie Naiman, will accompany. Who knows who else might show up?